There are plenty of tweaks available for the Notification Center in iOS 5. Yes, I know, there are many such Notification Center tweaks out there that add music shortcuts from the iPod app. However, this new Cydia tweak claims to be a little different from the others. Read more to find out how. Now Playing for Notification Center Cydia tweak has some extra features that makes it different than all the other similar tweaks out there. The tweak adds a widget to the Notification Center, which lets you change tracks, pause/play etc. apart from showing song details and album art. Swipe left to change tracks, play/pause and share the track on Twitter or Facebook. The Facebook share button will start working when iOS 6 is released. The widget works for third party Music apps as well. The Now Playing for Notification Center tweak also has iPad and Dashboard X support, which means that you can add the widget to your homescreen as well. 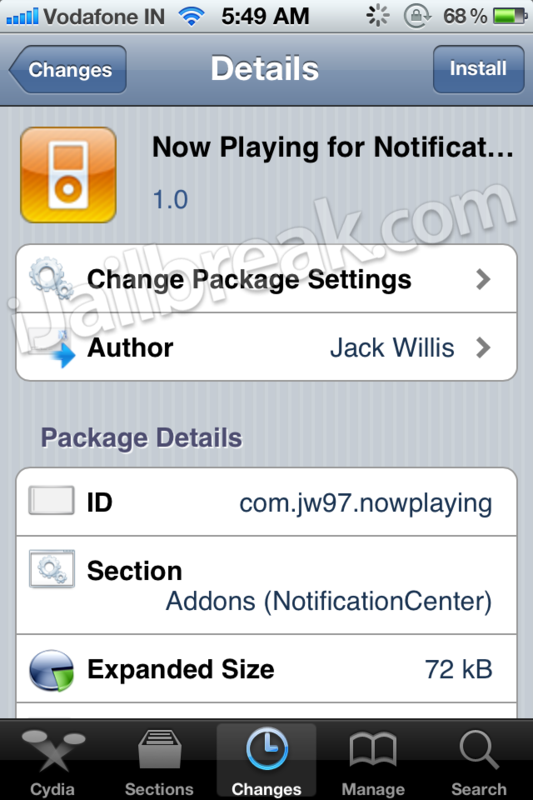 Now Playing for Notification Center is available for free in the BigBoss repo. Try it out and let us know what you think of this tweak. Is it really that different from the others?